Year-round machzor, Ashkenazi rite, with commentary and laws by R. Binyamin HaLevi Ashkenazi, rabbi of the Ashkenazi community of Salonika. [Salonika: Shlomo and Yosef Yaavetz, ca. 1550]. First edition. This machzor was published for the Salonika Ashkenazi community. It is the first edition of the machzor with the commentary and laws by R. Binyamin HaLevi. Much of the laws and commentaries were later printed in the Sabbioneta-Cremona edition in 1557-1560 and in another edition printed in Venice in 1568. There, the laws and commentaries are titled Maaglei Tzedek, and from then on, they were called the Maaglei Tzedek commentary or Machzor Maaglei Tzedek, and were printed alongside the text of many editions of Ashkenazi rite and Polish rite machzorim. See: D. Goldschmidt, Mechkerei Tefilla U'Piyyut, Jerusalem 1980, pp. 252-265; Y. Yudlov, Ginzei Yisrael, Jerusalem 1985, no. 322, pp. 70-71. The editor of the machzor and the compiler of the laws is R. Binyamin HaLevi Ashkenazi, rabbi of the Salonika Ashkenazi community and a leading Torah scholar of his times. In addition to the laws, R. Binyamin added to this machzor several piyyutim that he composed, including a lamentation (leaf ) relating to the great fire of 4th Av 1545 and to the epidemic which took the lives of four of his children in 1548. 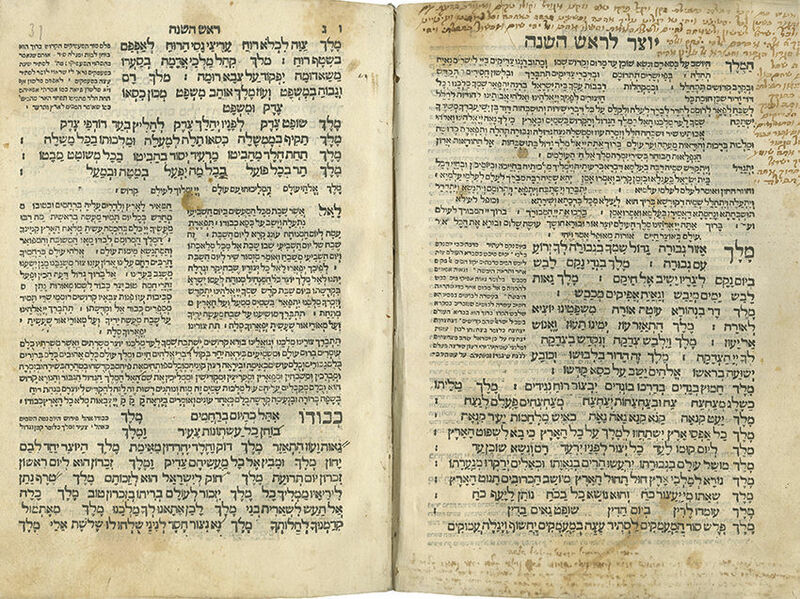 The machzor was printed without a title page and does not contain weekday prayers. The two volumes contain glosses in Sephardic and Ashkenazic scripts, containing additions and textual corrections. A prayer for the chazzan on the High Holidays is copied before the Yotzer prayer for Rosh Hashanah (in early Ashkenazic script). Censor's deletions in many places. In the first volume, owners' signatures appear at the beginning of the Selichot for Monday, Thursday and Monday: "This machzor belongs to me, Chaim son of R. Mordechai HaLevi" (deleted); "Belongs to me, Avigdor son of R. Yosef Sofiali". The first leaf of the second volume appears twice; presumably, one of them was added from another copy. One is bound and the other is detached. The detached leaf bears the signatures: "This machzor belongs to me, Chaim son of R. Mordechai HaLevi" (deleted); "1667, belongs to me, Avigdor son of R. Yosef Sofiali". Incomplete copy. Vol. I:  leaves. Vol. II:  leaves (first leaf appears twice). Total:  leaves. Lacking 33 leaves: from Vol. I, leaf ; from Vol. II, leaves - and last 30 leaves (including the colophon). Most of the lacking leaves were replaced with photocopies. Vol. I: 28.5 cm. Fair condition. Stains and wear. Large slightly-dark stains to several leaves. Dozens of leaves are damaged with heavy worming and many tears, repaired with paper, affecting text (the book was professionally restored, the missing text of many leaves was replaced with photocopies or by hand). Vol. II: 28.5 cm. Condition varies, fair-good to good. Stains and wear. Many dark stains to first ten leaves and dampstains to some leaves. Tears and damage, affecting text. Open tear to one leaf, with loss of approximately half the leaf. Paper reinforcement in several places. New bindings. Provenance: Collection of Dr. Israel Mehlman.